Our society is fast running out of fuel. Our lives are like a vehicle in passing. 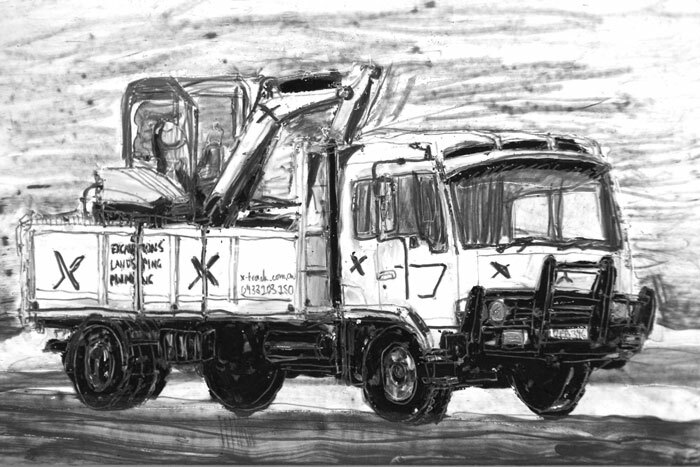 'Vehicular attraction' is the catalyst for Zachariah Fenn’s newest series, whereby he is drawn to the utilitarian form and aesthetics of urban service vehicles. ‘In Passing’ presents a suite of prints, drawings and paintings of heavy vehicles, embodying the frenetic energy of urban life. 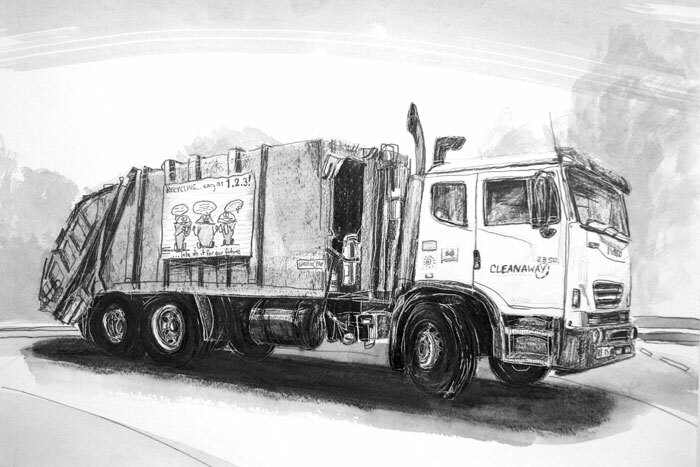 The tonal nature of the black and white studies emphasises the motion, weight and presence of these wheeled machines.Being immersed in the busyness of Sydney traffic for vocation, Fenn recreates artworks of trucks, work vans, utes and 4WDs that he has glimpsed in passing. The new photographic series by Emilio Cresciani documents the decay of the automobile in Western Sydney as seen in car-recycling yards. 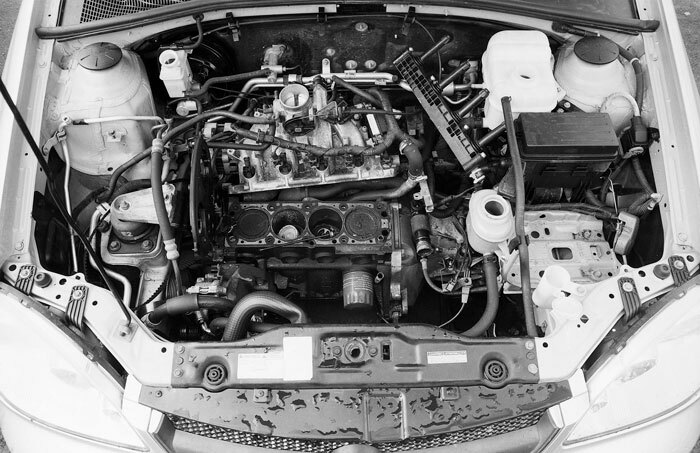 It features close-upshots of engine bays in landscapes of vast rows of cars. Hundreds of smashed cars, row upon row with their bonnets up, are picked apart by car-lovers for the remaining salvageable parts.The skeletal structures of these once-loved vehicles now lay idle likecarcasses in a mechanical wasteland. Cresciani documents the vehicular forms decaying over time, fascinated by the abstract patterns and contrast in texture, shape and size. 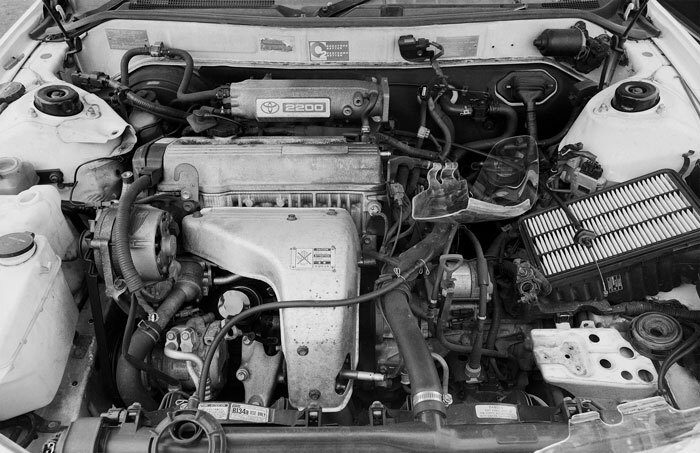 Black and white photography alludes to the history and nostalgia that these vehicles carry. In passing, they recall memories of our first car, family outings, road trips and work. They were once highly valued,looked after, polished and cleaned. In contrast, the audience is alerted to the dark realities of rampant consumerism and the devastation of our environment as it becomes increasingly mechanised. 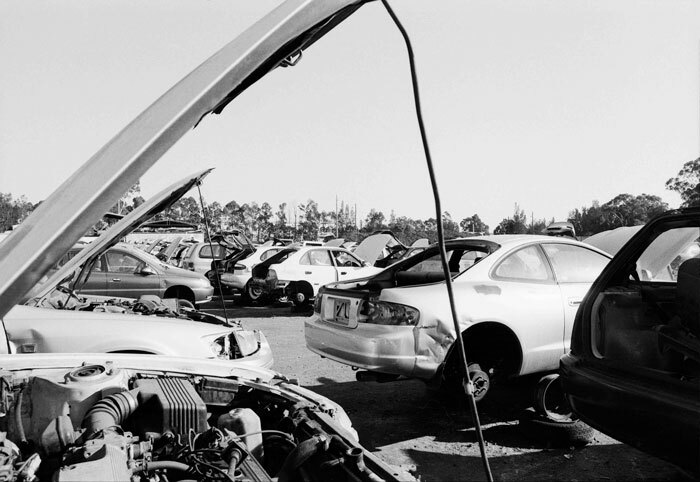 The aftermath is a vehicle graveyard – the sombre consequence of our car-dependent culture. 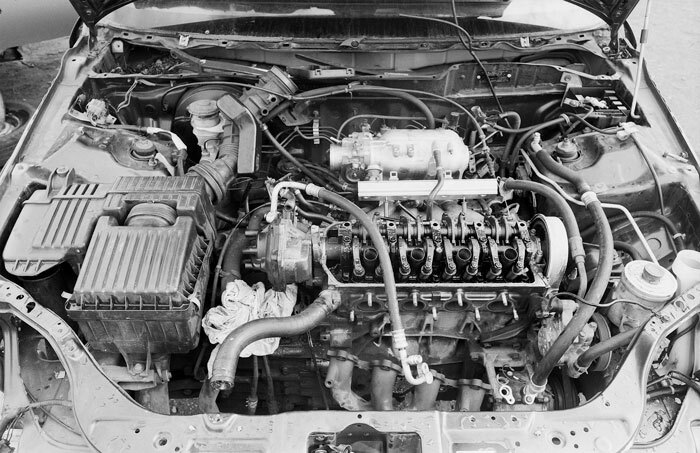 The exhibition utilises the automobile as a comparative symbol of our own humanity. ‘In passing’ is a snapshot of movement,kinetic energy and ultimately the brevity of life, presented in Zachariah Fenn’s graphic depictions of functional everyday vehicles. Emilio Cresciani’s photographic series documents the inevitable demise of the automobile in passing – an enduring reminder of the limitations and consequences of our consumerist society. 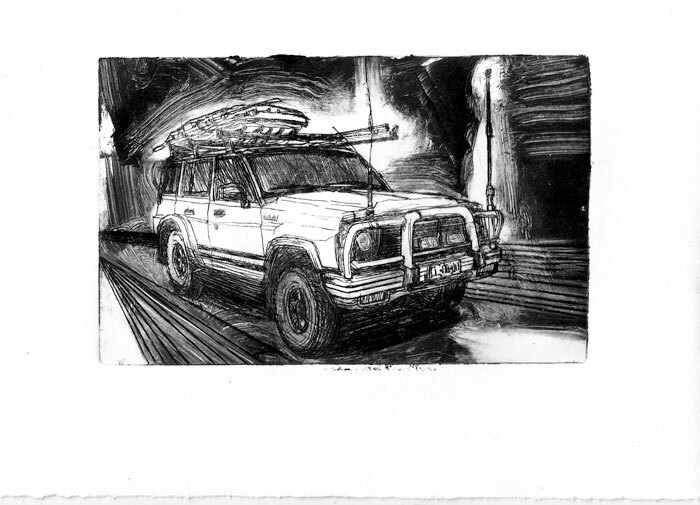 Where Fenn draws upon the ‘vehicular attraction’ of utilitarian vehicles, Cresciani captures vehicular decay – a juxtaposition that enables the viewer to recognise the complex beauty in the unattractive. Both artists’ works depict the fleeting nature of our experiences and possessions – our inventions are not designed to last. In-built redundancy ensures that the wheel of production keeps spinning,but for how long? How long until we break down? Our society is fast running out of fuel. Our lives are like a vehicle in passing. Emilio Cresciani explores the redundancy and waste of our modern consumer lifestyle – the ‘non-places’ of our landscape such as tips,derelict service stations, road works. He finds beauty in these places of repulsion, neglect or obsolescence. Graduating from SCA Cresciani was a finalist 2018 Mandorla Prize, 2017 Bowness Photography Prize, 2015 Chippendale New World and Agendo Prizes, and 2010 National Youth Self Portrait Prize. Zachariah Fenn explores notions of nomadism and movement through an adaptive, process-driven art practice. Heresponds intuitively to the world around him, re-envisaging contemporary imagery with his distinctive mark making and drawing style. Fenn utilises found materials, urban sites and momentary experiences as a catalyst for addressing environmental, spiritual and humanitarian concerns. Fenn completed his BFA at UNSW Art & Design, with Honours in 2015. He has exhibited regularly since 2011 and was a finalist in the Pro Hart Outback Art Prize in 2018, Emerging Young Artists Prize and Kudos Award in2015, and winner of Desert Equinox Solar Art Prize in 2016. He has professional industry experience in Art Installing, Fine Art Logistics and Art Mentoring, and is establishing his Artistic career through commissions.